Minorities and mortgages: Why hasn't the trend changed? The percentages of disparity in lending among whites, blacks and Hispanic buyers. The reasons for the disparity, including perception, class and prejudice. A discussion of discriminatory tactics eliminated by the Fair Housing Act of 1968 and how they affect today’s market. Minorities are still being denied the approval of loans nearly two to three times as much as white homebuyers. Does the term “American dream” still apply when a large percentage of residents aren’t even eligible? Owning a home is the foundation for the ethos of desired living, but inequalities in the market leave out a steady number of citizens who are denied approval for the financing necessary to make the investment. Homeownership is an avenue to wealth and savings for most people, but it’s a path that isn’t available equally. Mortgage approval rates, decrease in investment valuation and ingrained historical practices perpetuate an environment that is impossible to thrive in for the minority population. Many factors perpetuate an environment impossible to thrive in for the minority population. Without the power to purchase a home outright, most buyers are left with the decision to take out a mortgage. But it isn’t a simple means of ask-and-receive; there are multiple factors considered during the process that decide whether an applicant is either approved or denied. Financial aspects are central in the consideration process, but there’s more going on than simple economic stability. A study conducted by online real estate retailer Zillow revealed that white homebuyers applying for a conventional mortgage are denied roughly 10 percent of the time. However, black buyers applying for identical loans are denied 28 percent of the time and Hispanic buyers 22 percent. The study also cited the reasoning behind the disparity, and though part of the explanation is based on monetary metrics, it’s not the only component being exploited. Taking these figures into account, the dissimilarities in homeownership between black and white households have held true since 1900. 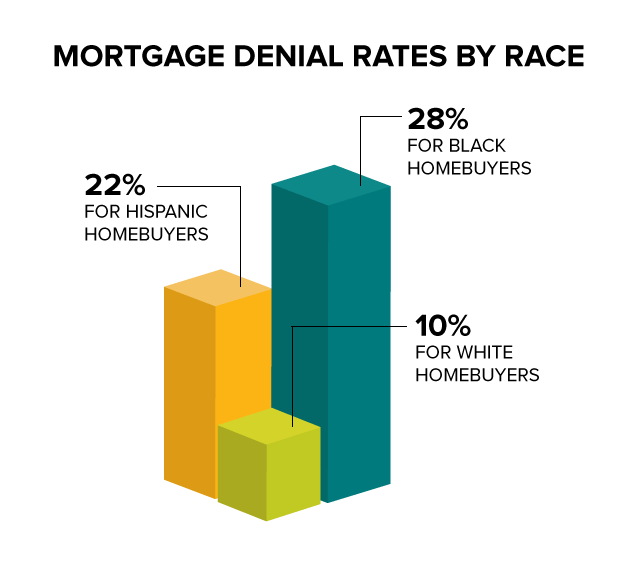 Salary, home values and home location are aspects considered in any mortgage application, but these numbers in combination with the stigma of racial perception are what fuel the inequality in lending. The average median household income for black families is typically less per year than that of white families. Furthermore, minority neighborhoods have shown to exist in areas perceived as less desirable in the market, which means the values of the homes fluctuate more drastically than those in predominately white areas. Minority neighborhoods have shown to exist in areas perceived as less desirable in the market. On an individual level, the denial rate is logical, but they should remain consistent across all applicants regardless of race if money is the only factor under scrutiny. A perceived variance in home value alone doesn’t justify explicit group-prejudice. Even with the Fair Housing Act of 1968 ending the lawful use of processes such as redlining and segregation, the residual effects of historically discriminatory tactics remain operative. In the past, the practice of blockbusting was abused by contract sellers to exploit minority buyers. Sellers would buy homes at discounted rates after intimidating white families to withdraw from neighborhoods by falsely implying that black families would be moving in. The contractors would then mark up the prices of the homes and resell them to black families. The influx of black households caused property values to drop in these communities, and though the process has long since been deserted, the stigma against minority neighborhoods remains. Minorities lose the chance for advancement when a disparity in lending and ownership exists. Minorities ultimately lose the opportunity for monetary advancement over time when a disparity in lending and ownership exists. Gaining equity through homeownership is how the majority of people build wealth because it becomes a means for overall asset retention and investment ability. But having to buy homes in less equitable neighborhoods means that minority families profit less over time, as their housing values respond more drastically to fluctuations in the market. Their investment doesn’t lend the same return as those made in predominately white neighborhoods because the properties appreciate at varying amounts. Perceptions of the past merging with the modern real estate environment keep imbalances in lending extant. It reinforces segregation and perpetuates an expanding racial wealth gap. Though the discrepancies in mortgage rate approval have reduced somewhat when compared to historical data, minorities are still being denied the approval of loans nearly two to three times as much as white homebuyers. Minorities are denied approval of loans nearly 2-3 times as much as white homebuyers. Mary Bradford is a freelance writer for New Home Source. Can your clients afford to wait to buy a home? Should long commute be deal-breaker for buyers?